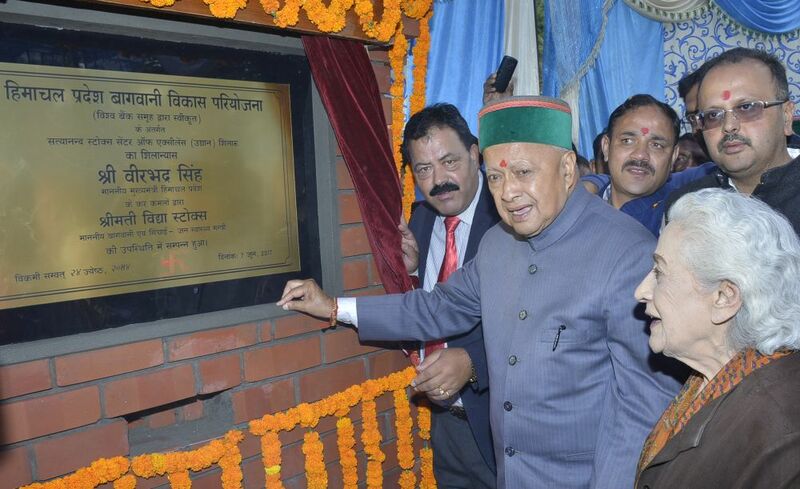 Shillaru/Theog: Chief Minister Virbhadra Singh today laid foundation stone of Satyanand Stokes Centre of Excellence of Temperate Fruit at Kot-Shillaru and Sabji Mandi at Sandhu in Theog constituency of Shimla district. Emphasizing constant training and adopting new farm technology for ensuring quality fruit crop production, the Chief Minsiter said the project has been launched taking into consideration for improving the quality of fruit products Vis-a Vis to adopt latest technique for pollination management and to induce new lease of life for unproductive orchards besides up-gradation of technology. He said that in order to address constraint of low productivity of fruit crops in the State, the government has signed a project of Rs. 1134 crore with World Bank for rapid and sustainable development of horticulture sector. The project will be implemented in all the 12 districts of the State for next five years. The Chief Minister said that Satyanand Stokes Centre of Excellence of Temperate Fruit at Kot-Shillaru would have high density orchard of apple, pear, cherry and clonal to make aware and demonstrate the growers about the latest technological advantage of high density plantation for higher production. He said special provision had been made in the project to develop community irrigation facility covering 19560 hectares of project area under irrigation to ensure availability of water during summer and critical stages of plant growth. The Chief Minister said that ban on use of wooden boxes met severe opposition from many but the decision was taken in the larger interest of the State. It popularized use of corrugated boxes for packaging, which helped in afforestation measures. He announced a market sub-yard for Kot-Shillaru, community hall and widening of road up to Mandir Manan in the area. Horticulture Minister Vidya Stokes said imported fruits often caused glut in the market and farmers suffered despite toiling hard in the fields. She said that the project would create such facilities like Centre of Excellence for fruits that will not only increase production but also maintain international standards for better price. The Centre of Excellence will be a platform for imparting professional training to unemployed youth, so as to start self-employment venture after acquiring skills at the centre.